Terra Nova Books, 9781938288401, 180pp. The Jews of Aleppo, Syria, had been part of the city's fabric for more than two thousand years, in good times and bad, through conquerors and kings. But in the middle years of the twentieth century, all that changed. To Selim Sutton, a merchant with centuries of roots in the Syrian soil, the dangers of rising anti-Semitism made clear that his family must find a new home. With several young children and no prospect of securing visas to the United States, he devised a savvy plan for getting his family out: exporting his sons. In December 1940, he told the two oldest, Meir and Saleh, that arrangements had been made for their transit to Shanghai, where they would work in an uncle's export business. China, he hoped, would provide a short-term safe harbor and a steppingstone to America. But the world intervened for the young men, now renamed Mike and Sal by their Uncle Joe. Sal became ill with tuberculosis soon after arriving and was sent back to Aleppo alone. And the war that soon would engulf every inhabited land loomed closer each day. Joe, Syrian-born but a naturalized American citizen, barely escaped on the last ship to sail for the U.S. before Pearl Harbor was bombed and the Japanese seized Shanghai. Mike was alone, a teen-ager in an occupied city, across the world from his family, with only his mettle to rely on as he strived to survive personally and economically in the face of increasing deprivation. 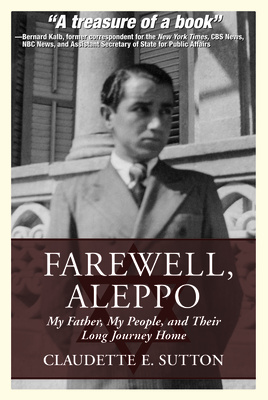 Farewell, Aleppo is the story told by Mike's daughter of the journey that would ultimately take him from the insular Jewish community of Aleppo to the solitary task of building a new life in America. It is both her father's tale that journalist Claudette Sutton describes and also the harrowing experiences of the family members he left behind in Syria, forced to smuggle themselves out of the country after it closed its borders to Jewish emigration. The picture Sutton paints is both a poignant narrative of individual lives and the broader canvas of a people's survival over millennia, in their native land and far away, through the strength of their faith and their communities. Multiple threads come richly together as she observes their world from inside and outside the fold, shares an important and nearly forgotten epoch of Jewish history, and explores universal questions of identity, family, and culture. It began with a three-year-old, her son Ariel, when Claudette Sutton realized the need she shared with parents like herself for an information source about services and activities for children in her hometown of Santa Fe, New Mexico. Since then, the newsletter she founded to meet that need has grown into an award-winning quarterly newspaper that has been expanding its scope and contribution to the local community for almost twenty years. That interest in children and families would surprise no one who knew the close-knit world of Syrian Jews she had grown up in, a people whose loyalty and concern for each other had helped preserve their culture over thousands of years and a twentieth-century transplanting across continents. It was an odyssey that had begun for the Sutton family on the day in Aleppo, Syria, when her grandfather decided that safety in the face of rising anti-Semitism required him to "export his sons," beginning with the oldest, Claudette's father, Mike. Decades later, when Dad asked her to "help me get my story down on paper," she was honored and eager. The interest in families that she had felt all her life and the experience as a writer nurtured since her first reporting job as a teen-ager now have come together in the creation of Farewell, Aleppo. With skill and passion, combining thorough research with multiple interviews and first-hand knowledge, Claudette tells both her own father's unique story and the captivating larger tale of how a people once battered by history have in the end survived and thrived.